Out of the classroom experiences and other cool things to try for learning in 2019 – Steal These Thoughts! Well my friends, let me drop some knowledge and share some things you could look to do. Share your team’s work with the business, what you’re working, what’s coming soon. Get your people involved too, post articles from your people explaining what they do, how they do it and feature spotlights on tools, processes etc. Do you know that video continues to rise as the largest form of consumed content by humans today? Maybe you should jump on this bandwagon. You can film internal masterclasses, film yourself talking about new learning programmes and even better get your people involved. Encourage them to share short 1-3 minute clips, sharing their learning stories, tips, advice and reviews. You don’t need any fancy equipment to do this. I use my phone and imovie or a free editing app called Shotcut to put it all together and share with the world. (Keep an eye out as I’ll be posting a how to make your own videos for L&D in the next few weeks). If you’ve read any of my work before, you’ll know just how important I feel marketing and engagement is in the world of L&D. How about you help yourself with raising the brand of your learning team and it’s work through creating mini secret marketing teams of your people across the business who can be the voice of learning for their area and champion your work to the masses? Does your business use Slack, Microsoft Teams or any of those other awesome collaboration tools? If so, you can put this to work for you. Most of these tools will allow you to create groups for people to come together, ask questions, share knowledge and truly enable a social learning experience. Why not build some groups for people in your business performing key roles and give them a place to support and learn from each other. Make it fun, engaging and a free flowing experience. Show your people where they can take their career in your business and all the great stuff you have to help them develop the skills and experiences to get there. Ask them to review your resources and their skills to identify what 3 resources and experiences they could use to develop their talent stack in the next 6 months. What’s the prize for this you say? Well it’s not some lame badges or a certificate, it’s the accolade of your people investing in themselves and building skills so they can set themselves up for more success in their careers. There are literally millions of free resources online that you could share with your people. Everything ranging from TED talks, insightful books and content of some of the leading thinkers and innovators across many industries. All of these are great tools to supplement your internal learning offer and showcase the possibilities to your people. Many people are familiar with a mentoring model of an elder parting wisdom to someone of a younger generation in navigating their business, career, life and more. This is great, yet mentoring has much more potential than this. Over the past few years I’ve been experimenting with what I can only describe as a skill swap mentor relationship. Where I share a particular skill set I have with a colleague so they can add it to their own stack or vice versa, where I’m the mentee learning a new skill from a pro. This is a process I thoroughly enjoy and find so much use in alongside the traditional mentoring model. We can all share our skills with those of any generation and in fact, learn many things about navigating the world around us at the same time too. Contrary to what some people say, newsletter are alive, well and can be a great performer if used correctly. Just because this method might seem a bit old school now compared to social media, it doesn’t mean it’s dead and buried. I can tell you from experience that an effective newsletter campaign can transform the impact and engagement of learning resources across your business. If you want to enable your people to find the resources they need for when the times comes, then I’d suggest creating a constant connection with them so they are informed on everything your team has to offer. Now you could easily do this via digital channel like a collaboration tool, but sometimes it’s good to get some old fashioned face time with the people. Why not try to host a regular weekly/monthly learning meetup across different areas of your business to connect with your audience. Build this forum so they can meet you, ask their burning questions on learning resources and provide guidance on developing their career in the business. You don’t need much for this at all, find a table, a chair and a open location, bring yourself and voila – you have a first learning meetup. This is all I can think of for now, as I write this early morning brain dump. However, I will commit to updating this list throughout the course of 2019 with anything else that strikes me as useful and of course I’d love to hear thoughts from any of you whom decided to read this. Share those thoughts, ideas and everything else in the comments below. 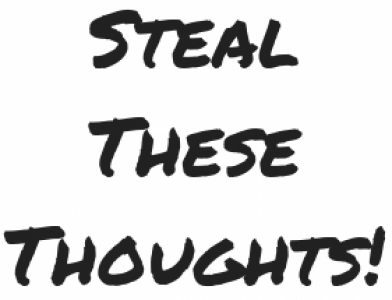 Previous Post Steal These Thoughts! Newsletter: Are we embracing all the learning opportunities available?